Showing results for "motorola droid razr maxx"
eBay Black Motorola Droid Razr Maxx HD 32GB Verizon 4G Smartphone XT926 Clean ESN! Product Description: Boasting a beefier battery of 21 talk-time hours the new RAZR MAXX by Motorola is still thin by smartphone standards and going to be a top choice for power users. When you've got Motorola calling it the longest-lasting smartphone you definitely want to get premium protection you can rely on. The OtterBox Defender Series RAZR MAXX Caseby Motorola is the case that delivers practically indestructible protection from heavy use and rugged conditions. Ensure your mighty new RAZR MAXX is ready to take on your life with an OtterBox. A belt clip holster is included that doubles as a media stand. 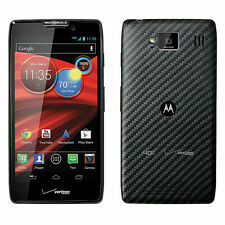 NOT FOR RAZR HD NOT FOR RAZR MAXX NOT FOR RAZR NOT FOR MAXX NOT FOR ULTRA Shell Case with Kickstand for the Motorola Droid RAZR MAXX HD 926M ONLY!